It’s always a great day when working Biceps and Triceps. Today’s workout has you doing ladder sets for Biceps and increasing sets for Triceps. Remember a Ladder set is going up in reps and then coming back down. So for example in the first exercise you will do 5 sets of cable bicep curls, but you do not go through all those sets 5 separate times. This is how it goes: set 1 is 15 reps, set 2 is 18 reps, set 3 is 21 reps, set 4 is 18 reps and the last set is 15 reps. Then you move on to the next exercise. 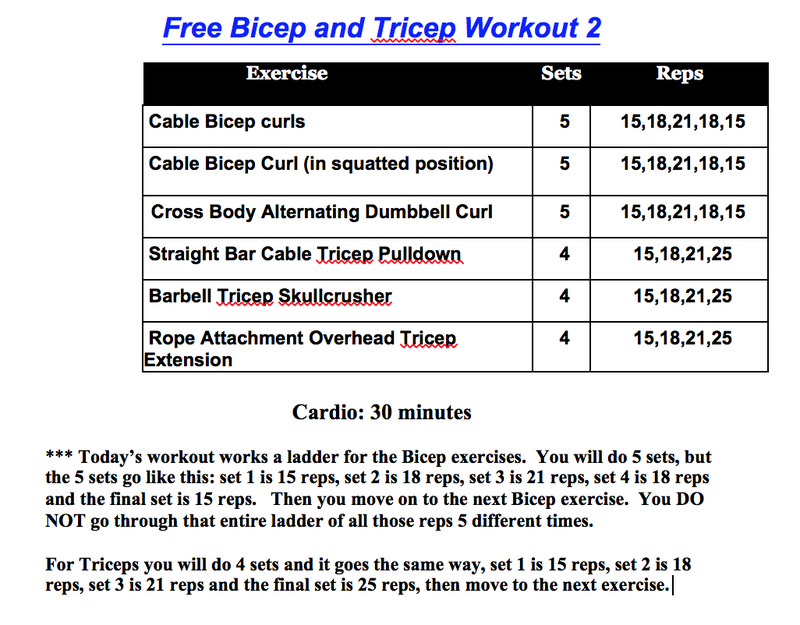 Triceps you will be doing 4 sets, which is similar. Your first set is 15 reps, set 2 is 18 reps, set 3 is 21 reps and the fourth and final set is 25 reps. So work hard, try and increase your weight as you go through your sets and only allow about 30 seconds of rest time between each set. You can give yourself about 60-90 seconds to rest and get some water between exercises. Commit 2B Fit! !